A platform for discussing practical solutions and ideas for urban issues across the globe. 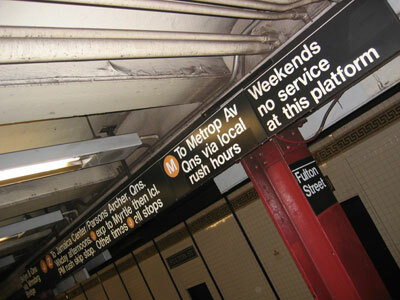 Subway Station Signage: Is it enough; is it helpful? The Subway system of New York City is one of the largest and most intricate in the world. It has over 450 stations, over 5 million weekday riders and no fewer than 34 lines. It is also operational 24 hours per day thanks to its unique local/express track configuration, which allows maintenance work to be conducted overnight as trains can be rerouted to one of four tracks. Yet with this complicated system – the lifeblood of the city – comes the problem of navigation. Some stations are rather simple with only one entrance and exit and no transfer possibilities. Others are at the convergence of multiple lines, have pedestrian tunnel connections to stations blocks away and boast exits at nearly every street corner within a two minute walk. How are people supposed to know where to go? Knowing where each way brings you saves time as you can bypass waiting at a crosswalk – a natural aversion for New Yorkers. Signage is an overlooked necessity, it seems, for the Metropolitan Transportation Authority (MTA), which operates all NYC Subway lines. The basics are there. Station entrances clearly mark which lines are accessible from the stairwell you are about to descend and platforms are marked with which line will stop where you are standing (although often these signs can be chock full of complicated information to a novice or even a seasoned veteran). Yet what to me seems a very basic signage necessity is which way you should walk to exit the station. In most cases there is a sign somewhere informing you of where the exit is, but sometimes there is a corner of the station devoid of such help. Let’s take 34th Street – Penn Station on the ACE line as an example, perhaps because I know it best as my home station. This is a major station due to its status as a commuter hub where New Jersey Transit, Long Island Railroad and Amtrak trains all terminate, dumping the alighting passengers who mostly continue their commutes by transferring to the the Subway (it’s not a pretty sight at 8.15 in the morning, but let’s leave that for a separate post). From the centre platform where the express trains stop, passengers must take the stairs down to the underpass that goes beneath the tracks towards the exits. When you reach the bottom of the stairs you must go either left or right – pretty simple, right? Well depending on where you go, left or right can make a big difference. From the particular stairwell I am using in this example, going right will bring you to the west side of 8th Avenue while left will bring you to the east side. Knowing where each way brings you saves time as you can bypass waiting at a crosswalk (a natural aversion for New Yorkers) at street level and instead keep moving underground in the direction of your ultimate destination. As you have probably guessed by now, the bottom of the staircase in this underpass does not have a sign informing passengers which way leads to which exit. Instead passengers are left to guess and waste time. Installing such a sign would prevent confused passengers, many of them seasoned straphangers*, from making an abrupt about-face into a rush of commuters, causing body collisions, grumbles and the not-so-infrequent use of expletives. The relatively low cost of such a sign would keep foot traffic flowing smoothly and the station clear of congestion and confusion. *a Straphanger is a standing passenger in a subway, streetcar, bus, or train who holds onto one of the short straps placed along the aisle, although in present day NYC the straps are long gone and riders hold the bars, yet the appellation remains. Excellent points. Good luck with the blog.